We would love to be part of your wedding by helping with the favours for your guests. There are lots of options for you to consider. A. Fruits of Sherbrooke team member will consult to see what product you want and then will make it for you and have it ready for your pick up. Delivery is extra. What to Make. We make a wonderful array of products and can use our standard recipes for you. Take a look at our list of products for sale as a guideline. We can also customize a special jam or jelly that uses a fruit that appeals to you or create something that fits your colour scheme. To make a custom product involves a couple of meetings, creation of a recipe to meet your specifications and samples for you to taste and finalizing the recipe before production. This will be a $150 fee. Please note that all products made by Fruits of Sherbrooke will contain a minimum of 60% locally rescued fruit in the recipe. This is our identity and it is what will make your gift unique, local and sustainable. How will it be packaged. We suggest that you use the round 125 ml jar - the size of a baby food jar. This is a good size for people to carry home and does not take up too much room on your tables. Another option is the hexagonal jars that are very pretty. These jars cost more to purchase but they are only hold 110 ml. These hexagonal jars are shown in the top left photo. Lids: The most economical lids are gold in colour and if they are going to be covered, this is a good choice. For an additional 5 cents each you can have either a white or black lid. Labels and toppers for the jars. We make the product and fill the jars you have chosen. We can provide our standard topper for the jar or our standard label for the side of the jar with our name and list of ingredients if you want. You can also receive the jars with nothing added to the outside and then create and add your own topping with cloth, ribbon and tag or add your own custom label to the side of the jars. Details: 1. There is a minimum order of 84 jars (7 dozen) that is all of one flavour. However if you select product already made and ready to go, then there is no minimum. 2. We need a minimum of 3 weeks from confirmation of the order with a deposit until it is ready for pick up. 3. To confirm your order, 50% of the final fee is to be paid in advance as we have costs to cover if you fail to complete the order. The remainder is due upon pick up of the products. 4. For customized products, the whole fee of $150 is due at the first meeting. Gather a small group of up to 6 people to make your own gifts. You will have to set a day with us and let us know what you plan to make, how many jars, the specific jar shape and size and the lid colour. We will determine that we have enough raw materials and will purchase the jars and lids on your behalf. What you will get is a kitchen that is set up for making jams plus all the equipment and tools. You will also have experienced Fruits of Sherbrooke staff to assist and teach jam making and assure safe procedures and cleanliness. The shopping will be done for you, and all costs for ingredients such as fruit, sugar, & spices plus the jars and lids are included in the price. 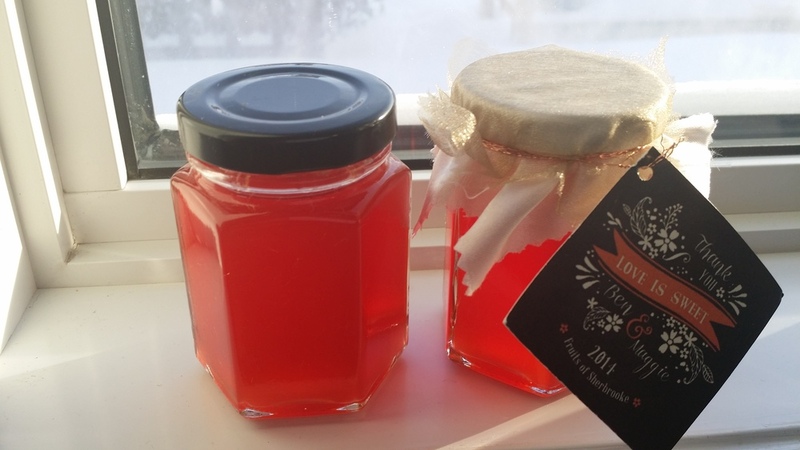 Costs: Customized jam or jelly can be created for the product that we make for you or for the product you are making yourself with our assistance. The final price is determined by a number of factors such as the size and type of jar and lid selected, the ingredients (use of nuts and alcohols and special items will increase the price), the quantity made. A 125 ml round jar of product costs $5 and a 250 ml jar costs $7 at the Farmers Market and your price will be in that range. Contact us and we can discuss your plans and give you a clearer estimate of the cost per jar. This past weekend a fabulous friend and I met with Carol and Fruits of Sherbrook staff to make 100 wedding favours for my wedding this summer. All round it was a wonderful experience and a very fun day. To start, there were many flavours of jam to choose from which was an exciting process in itself. We chose to make almond pear (my personal favourite), Saskatoon field berry and strawberry rhubarb. The 3 distinctly different colours will look great on a wedding table, I can envision it already. I had only made freezer jam previously so I was keen on learning how to make cooked jam with a shelf life. My fiancé perhaps was even more excited for me to learn this new skill! The staff was very helpful and encouraging. The 100 jars of jam were done before I knew it – time flies when you’re having fun. I feel really good about the gift my wedding guests will have to take home with them, specifically that I was able to help create this delicious treat. Thank you kindly to Carol and the staff at Fruits of Sherbrook for the lovely day, the new skills and the wedding favours.